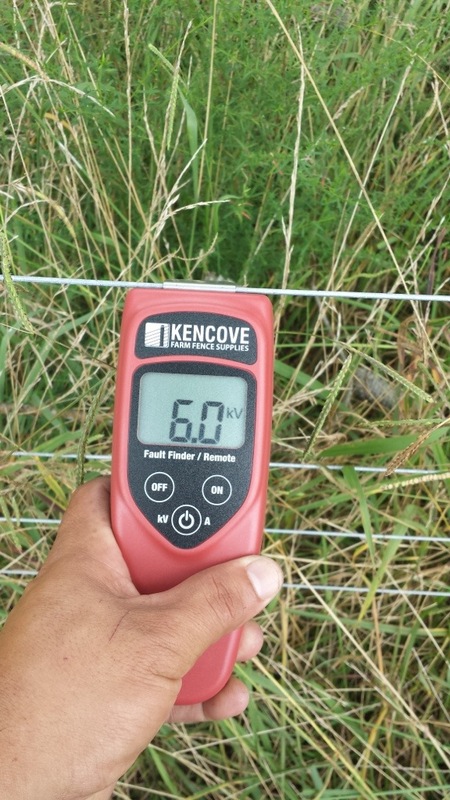 Kencove electric fence tester. If you have electric fencing, you NEED one of these. Before we started paddock shift grazing I had some really nice fence chargers that did a great job. They were about 1 joule of power but for one hot wire on top of hog wire with no contact to grass they did great. Then we added some temporary fencing and stopped having the cows mow the grass right down to the ground. So I bought a 2 joule fence charger. Double the power! Yeah, that didn’t work. So I called Kencove and asked them what I needed. I had heard great things about the Stafix chargers and they recommended that I get a 6 joule charger! Now were talking. We’re talking massive power, which Miguel confirmed when he accidentally touched a wire. So all was good in cow land. Then I decided to put the pigs in the pasture. That required putting the wire down on the ground and therefor further into the grass. It also meant adding more high tensile wire which was also in the grass. When we did all that, the voltage dropped all the way down to under 2000 volts which barely keeps cows in and you can forget about pigs. So back to Kencove I go to shell out even more money. I explain my problem, and let it slide that I hold them personally responsible for not selling me way more than I needed the first time. They recommend I get a 12 joule charger which is double what I have. After several rounds of this I have finally learned and I ask what is bigger than 12 joule. After a snarky comment about a 54 joule unit they sell we settle on the 18 joule charger. Pictured above is the result, through the grass, through all the connections, 6000 volts at the business end of the poly wire. Now that’s what I am talking about. A charger cannot be “too big.” If it is overpowered it will simply ramp down its output and loaf along. This is speaking of modern chargers here. Now if you go lay against the hot wire, it will ramp up and light you up. I’ve never seen anyone or anything go back for seconds on a hot wire. Everybody lies. The first chargers I bought were “50 mile” chargers. We estimated that they were about 1 joule. Who knows, they aren’t really rated. Mileage, estimates, ratings, specs. They all are pretty much meaningless. The day you install your new charger is actually the worst day to test because more than likely prior to spending money you went around and cleaned up all the possible shorts, bad connections, fallen limbs, etc. the fence is wearing its Sunday best when you pop your new charger in place and of course then tests at a great output. Then day by day things get worse as the grass grows, it rains, etc. by the time the power is down on the fence to unacceptable levels, it’s too late to return the charger you bought. It would have been way cheaper to buy the biggest charger I could ever conceive of buying the first time than to have worked my way up one by one. The only saving grace is that the Stayfix charger will work off of solar so I can use it in the back pasture where we don’t have power. Something I did plan for should it not be big enough. A proper digital tester like the one pictured is worth it’s weight in gold. The first one I owned came with the Stafix charger. It doubles as the remote. It finds faults but more importantly it gives you accurate readings without having to insert a ground probe. That means you are much more apt to actually test your fence which is really the key. Every time you turn the fence on and off you are also testing the fence. One grounded reel or line and cows are everywhere.